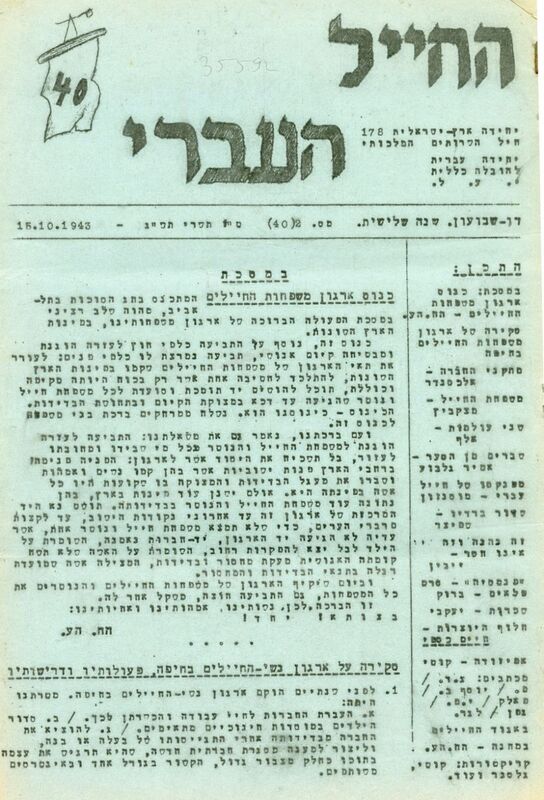 Six issues of the bi-weekly HaChayal HaIvri journal for the Royal Army Service Corps, Jewish Transportation Unit 178, edited by Moshe Monzon. [Egypt, Libya] Italy, 1942-1943. Issues 5, 7, 13, 15, 35, 40. The issues were published by stencil [some with illustrations] classified as "internal." Some of the issues were printed on the back of telegram sheets, which were used by the offices in Libya. The journal includes extensive articles about the activities of the Jewish soldiers, their daily schedule, their yearning for the Holy Land, the excitement when they received any mail, Shabbat meals at the Suez Canal, lengthy stays in the barren desert, daily life in Tobruk, reaction to the horrifying news from Europe ["when information arrived about what was done to us in Europe, we were shocked by the terrible reports ..."], the sanitary conditions in the camp, caricatures, and more. Six issues in stencil print. Aging stains, fine condition.